When I saw this scan I loved it so much that I wanted to put it up as my wall... so I vectored it. hmmm.. what I thought ended up pretty nice was Nami's dress :) I didnt really know how I was going to vector it at first.. But I just went along and it turned out like that! It was a pain doing all the flying petals.. = = But I did it! Aw damn, this is gorgeous, but Luffy picking his nose ruins the atmosphere for me... Great job on the vectoring though, it's superb. Oh, I've always loved that scan so I'm glad someone finally walled it! So many details and rich colors, I really love how you shaded everything. 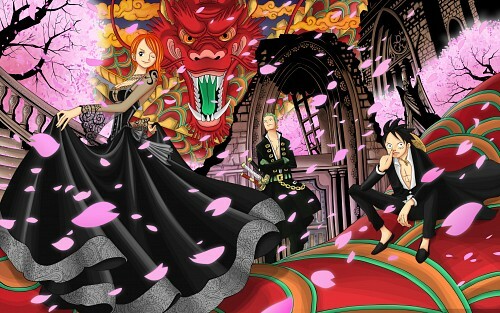 I agree, Nami's dress is looking wonderful. The only thing that bothers me are the sakura petals in the foreground, I think it'd look much better if the outlines weren't black, maybe even lineless would be better. Why don't you upload your walls in AP? You got nice talents! nice talent that you show in your wallpaper, is amazing, well colored and a very cool background, FAV+1 :D congrats! Good job vectoring the whole color spread. Everything looks great; my favorite parts are Nami's dress, the sakura trees and the dragon (who I used for color choices when I made my Robin wall a while back). wow this looks so cool! <3 <3 <3 ! wow this is simply amazing. definitely one of my new favs! -forgot to click post comment- darn! like everyone has been saying, you're amazing! *__________________________* I love it!my friend, you made a great wall!the colors, the decoration....everything is awsome! This is really awesome! I love that dress! The colors and movement are wonderful. Great work! Really great coloring job O.O It's stunning! I have to agree, Luffy ruins the atmosphere, but that's not your fault. A really awesome wallpaper! Keep it up! I love this pic. The only thing I don't like is that Luffy is Picking his nose. i love the dragon its awesome...the rest is cool too! I just recently got back from my China trip and checked MT, what I found was this awesome scan! WOOOT I like the colors. I also wanted to wall this scan. It's actually in my future-wallpaper folder but you did just awesome.